Photo: Hartford community partners share their experiences with Liberal Arts Action Lab Director Megan Brown (with laptop). Photo by Amber Montalvo ‘20. 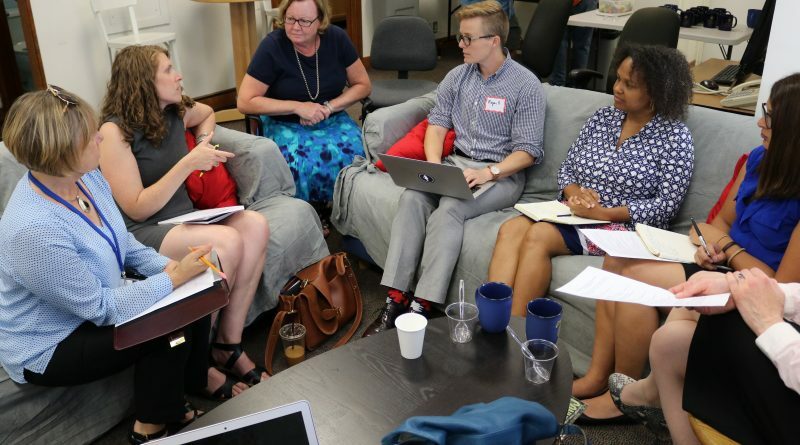 On three dates in August 2017, 24 Hartford community partners participated in three hour-long feedback sessions with a joint team from Trinity College’s Community Learning Initiative and Liberal Arts Action Lab. These sessions with our current Hartford partners focused on three agenda items: 1) their previous experiences working with the college; 2) their preferences regarding communication, planning, and execution of programs; and 3) how they want to work with Trinity students and faculty in the future. We asked such questions as: What worked well in your previous partnerships with Trinity College faculty and students? What could have worked better? What surprised you about the partnership? What do you wish Trinity faculty and students knew before they began working with you? Overall, partners spoke often about how and why projects with Trinity faculty and students were successful and were especially complimentary of Trinity students who are seen as hardworking, motivated, and smart. 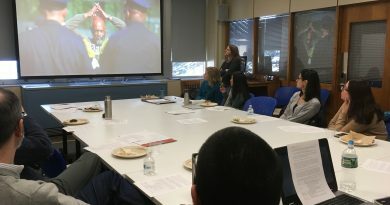 In addition to conversations about best methods for communications, the importance of classroom-based learning that aligned with community work, and possibilities for future projects, a few specific themes emerged, which will guide our plans as we centralize urban outreach from Trinity and strengthen our partnerships with community organizations in Hartford. 1 – Different Needs for Project Development: Partners had different perspectives on best practices for project development based on their own organizational goals and needs. Several school teachers and some non-profit partners noted that they appreciated when faculty brought them fully-formed ideas for projects. Alternatively, many others wanted to be more involved in the process as a co-creator of the project. These differences seemed to be based on how central such projects might be to the primary goals of their work (e.g., teachers’ daily work does not require external research support in the way that an advocacy project for a non-profit might). 2 – The Importance of Student Initiative: Several partners across both sessions discussed the importance of students “taking initiative.” Partners noted that their most successful projects involved students who were willing to jump into work without needing excessive goading or direction. Students who were willing to commit more time than required to do a project well, or who immersed themselves in a volunteer project fully from the start, were seen as the most helpful to our partners. These students, according to partners, also seemed to have more information about the organization and a better understanding of the goals of the project from their instructors. 3 – Mentoring Requires Time: Many partners are interested in and excited by the opportunity to mentor college students through community learning projects, but this kind of relationship often requires a large time commitment. Concerns about how long students were able to spend on a project were brought up frequently, whether partners were discussing the number of hours per week allotted to the project or the length of the semester (which can impede the long-term progress of a project). For students to fully understand the work of their organization and get involved in the project, they often need a larger time commitment both per week and over the course of the year. Megan Hartline, Associate Director of Community Learning, listens to feedback from Hartford community partners Emmanuel Adero and Frank Hagaman. Photo by Amber Montalvo ‘20. Organizations participating in these feedback sessions included: Achieve Hartford, Asylum Hill Neighborhood Association, City of Hartford, Center for Latino Progress, Community Solutions, Connecticut Association for Human Services, Connecticut Children’s Medical Center, Diamond Research Consulting, Expeditionary Learning Academy at Moylan School, HartBeat Ensemble, Hartford Foundation for Public Giving, Hartford Magnet Trinity College Academy, Hartford Preservation Alliance, and Park Watershed.